Road-cleaning chemicals can wreak havoc on your trucks throughout the winter. Winter is just around the corner and that means holidays, fun in the snow and hot chocolate. 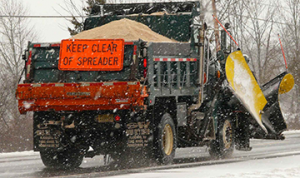 Unfortunately, it also means cold weather, road clearing chemicals and harsh conditions for your equipment. You can take a few simple steps to keep your quality Mickey bodies and trailers working and looking their best when winter is at its worst! • Increase the frequency of washing your equipment: Traveling highways treated for winter weather can leave residue on your equipment that is very harmful. Make sure to have your truck washed at least once a week to clean off harmful residue, and be sure to clean the bottom of your truck as well. • Ice scrapers or extremely coarse brushes can scratch and chip the finish of your equipment. Use caution when removing ice or snow from coated areas of the equipment. • Immediately following an ice and/or snow storm and whenever practical, wash the vehicles to remove all the chemicals associated with clearing the streets and highways that collect on the unit. Do not allow the vehicles to sit long periods of time with ice, snow and road chemicals on them without washing them. This is true particularly for units with full wraps. • Do not use heat to remove ice and/or snow from the decaled areas of the unit. This could damage the decals underneath. • Scrap ice and/or snow only from the glass surfaces on the unit. Mickey bodies and trailers are manufactured to withstand the elements, including hot and cold temperatures and severe winter weather. Overall, it just takes common sense and a customer’s pride in maintaining a good-looking fleet in winter conditions to insure the decals continue to perform and visually display the brand/message on each unit for a long time. Editor’s Note: Information in this article was supplied by Mickey Truck Bodies, Valspar and McKenzie Industries.